In the early 1970s, Marvin Zuckerman and Gershon Weltman, childhood friends from the co-ops of the Bronx, came across a rare Yiddish manuscript. Though they had never thought of putting out a book together, they quickly recognized that there was something in this document that made them want to take up the task of translating and publishing the work — dirty words. 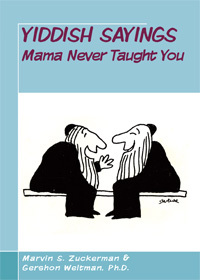 The result, “Yiddish Sayings Mama Never Taught You,” was released in 1975 and went through five printings before the press stopped. Now, due to both personal requests and the fact that bootleg copies have been circulating on the Internet, the two men have decided to give the book one more run. The nearly 230 sayings in the book, which appear in translation and transliteration as well as in the original Hebrew, open up a window into the indecent side of the shtetl, one that has rarely seen light. Az men shloft mit’n vayb, shtelt men der velt dem tokhes aroys. When you sleep with your wife, you show your behind to the world. Der pelts unter dem vaybershn boykh iz dos tayerste futerl. The pelt under a woman’s belly is the world’s most expensive furpiece. Itlikhes tepl gefint zikh zayn shtertsl, itlikhes petsl gefint zikh zayn lekhl. Every pot finds its own lid, every pole finds it own hole. An eygener forts shtinkt nit azoy vi a fremder. Your own farts don’t stink like someone else’s. The source of the material was a transcript by a folklorist named Ignaz Bernstein, a wealthy Ukrainian who collected nearly 5,000 Jewish proverbs at the turn of the century. He published all these in a two-volume collection — with the exception of 227 sayings that he published separately, for reasons unknown, under the title “Erotica and Rustica.” Unlike his main work, the proste, or vulgar stuff, had a very small run and remained little known until Zuckerman and Weltman got their hands on it. Zuckerman managed to get an early blurb for the book from Isaac Bashevis Singer. The two were presenting at a literary retreat near Ojai, Calif., and they spent some time together. Zuckerman passed Singer the book, then in manuscript form, on a Saturday night and asked the author to look it over. Singer came down to breakfast the next morning, with handwritten notes on the manuscript’s cover. He later joined Weltman and Zuckerman for lunch at the latter’s house in Los Angeles.